Traveling out west along the beautiful California coast and love what great finds there are! 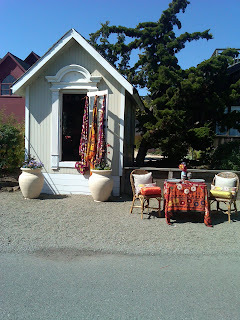 This cute little shop in Mendocino is fantastic! This very small 7 ft wide by 10ft wide frame house is pleasantly filled with amazing materials - pillows, throws, textiles from all over the world - by far one of my favorite finds!